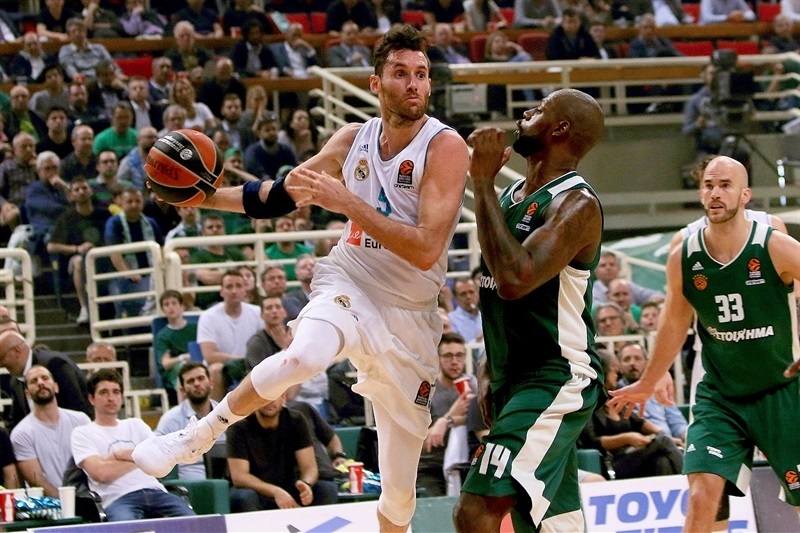 Real Madrid bounced back from a Game 1 loss in the Turkish Airlines EuroLeague Playoffs by edging Panathinaikos Superfoods Athens 82-89 in the Greek capital on Thursday. The best-of-five series is now tied at 1-1 with Madrid set to host Games 3 and 4 next week. The Greens led 40-36 at halftime before Felipe Reyes and Jaycee Carroll took over for Madrid, leading a 0-7 run that tied the game. Trey Thompkins also stepped up as Madrid grabbed a 61-68 margin after three quarters. 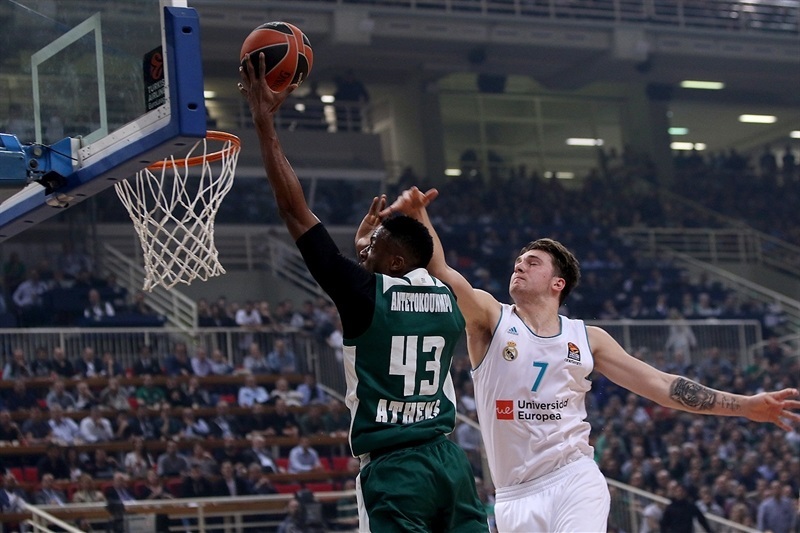 Panathinaikos tied the game at 68-68, but Thompkins and Rudy Fernandez rescued Madrid and free throws by Luka Doncic sealed the outcome. Madrid made 11 of 20 three-pointers (55%) and outrebounded the hosts 24-43. Reyes led the winners with 18 points and Carroll added 17, both off the bench. 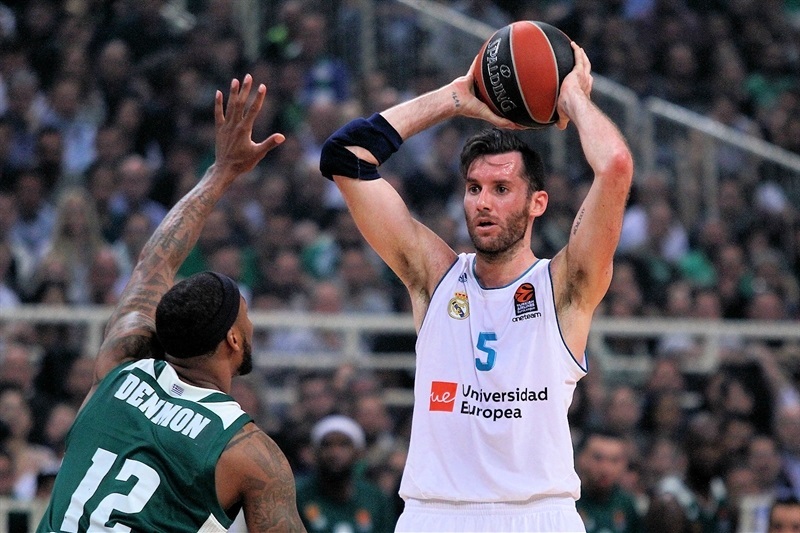 Thompkins scored 12 points and Fernandez had 10 for Madrid. 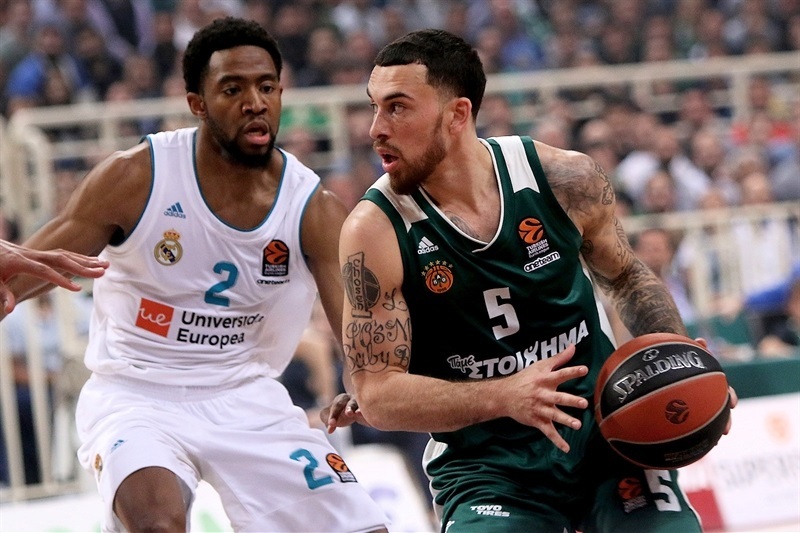 Mike James paced Panathinaikos with 20 points, Adreian Payne scored 13, Nick Calathes had 12 and Chris Singleton 11 for the hosts. 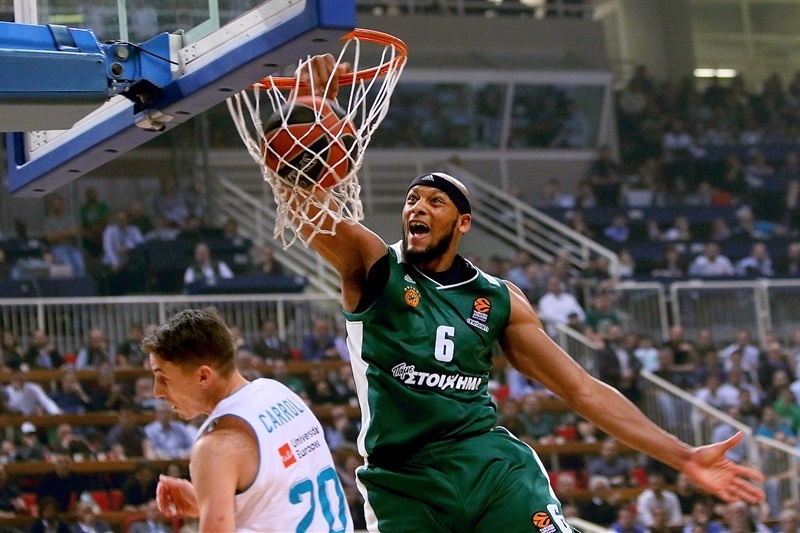 Fabien Causeur got Madrid going with a backdoor layup and Jeffery Taylor dunked, but James and Calathes soon gave Panathinaikos its first lead, 5-4. Taylor bettered Matt Lojeski's jumper with a triple before free throws by Thanassis Antetokounmpo and Singleton gave the hosts a 12-7 edge. Gist capped an 8-0 run with a big slam. Gustavo Ayon stepped up to keep Madrid within 16-11. Anthony Randolph took over with a put-back layup and free throws by Walter Tavares and Fernandez brought the guests closer. 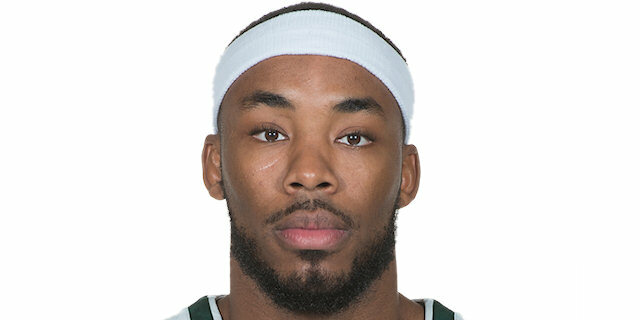 A corner three-pointer by Singleton boosted Panathinaikos's lead to 21-16 after 10 minutes. A tip-in by Randolph and a bomb from downtown by Carroll tied the game at 21-21 early in the second quarter. James hit a floater, but Reyes followed free throws with a layup for a 23-25 Madrid lead. 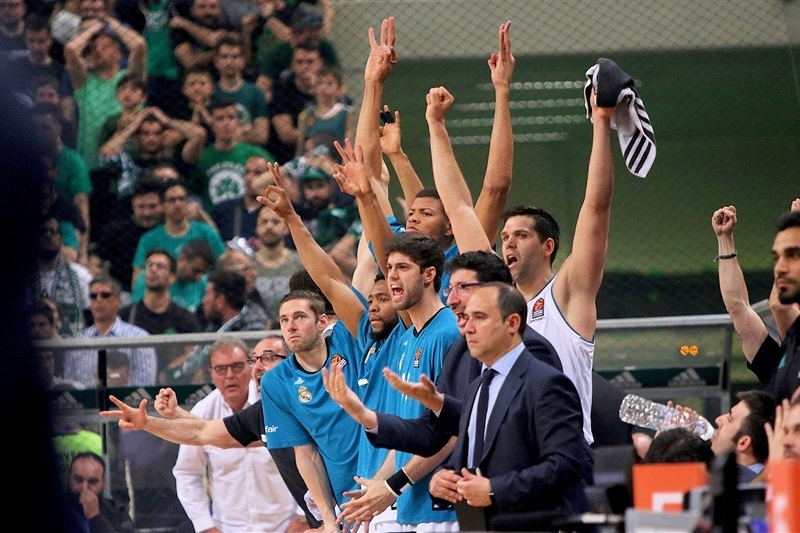 Payne rescued Panathinaikos with a big basket and consecutive dunks, but free throws by Fernandez and Reyes restored a 29-30 Madrid edge. Payne hit a jumper and three-pointers by Kenny Gabriel and Marcus Denmon prompted a Madrid timeout at 37-32. 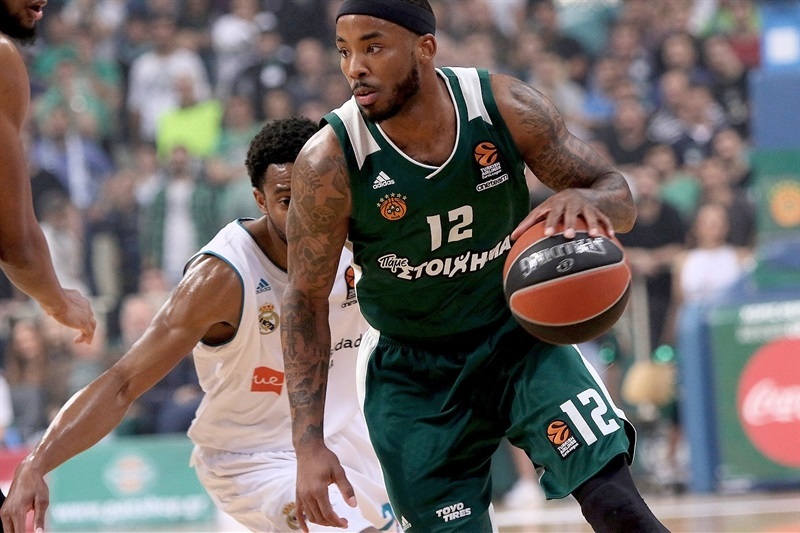 Thompkins joined the three-point shootout and split free throws, but Denmon and Calathes gave Panathinaikos a 40-36 edge at halftime. 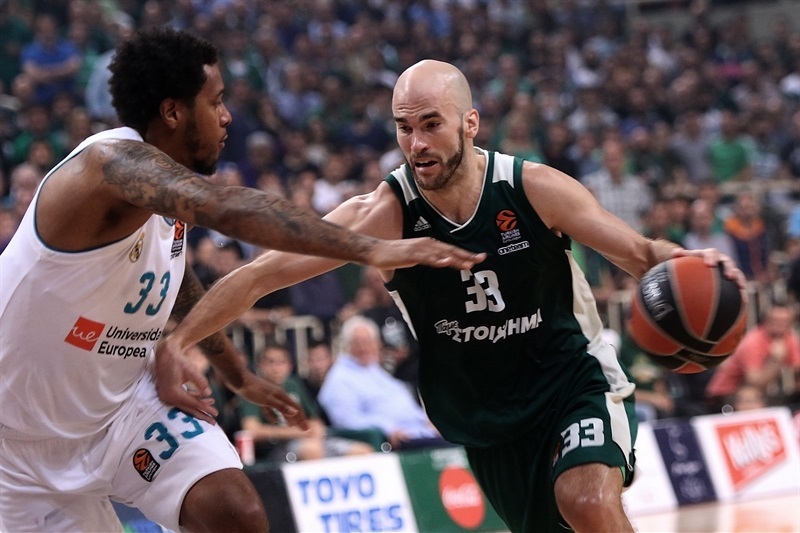 Calathes scored around the basket after the break and – even though Carroll answered from downtown – James and Antetokounmpo gave Panathinaikos a 7-point lead. Reyes and Carroll combined for all the points in a 0-7 Madrid, run but James hit a triple for a 49-46 edge. Carroll downed a three-pointer and Reyes copied him right after that to give Madrid the lead. Singleton and Ayon exchanged layups and free throws by Doncic made it 51-57. Lojeski stepped up with a layup and Singleton added a dunk and free throws, but Reyes remained unstoppable and a four-point play by Carroll boosted the visitors' lead to 59-65. A layup by Payne and a triple by Thompkins fixed the score at 61-68 after 30 minutes. James followed a layup with a jumper early in the fourth quarter and a three-pointer by Denmon caused Madrid to call timeout at 68-68. Fernandez swished a three-pointer, Taylor added a layup-plus-foul and Thompkins scored down low to make it 72-76. 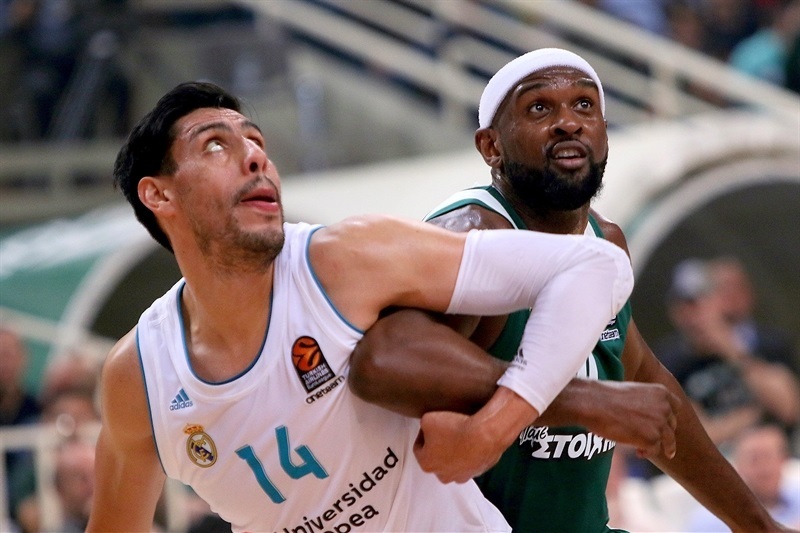 Fernandez and Calathes traded foul shots, James bettered Ayon's layup with a triple and Payne brought Panathinaikos within 78-80. 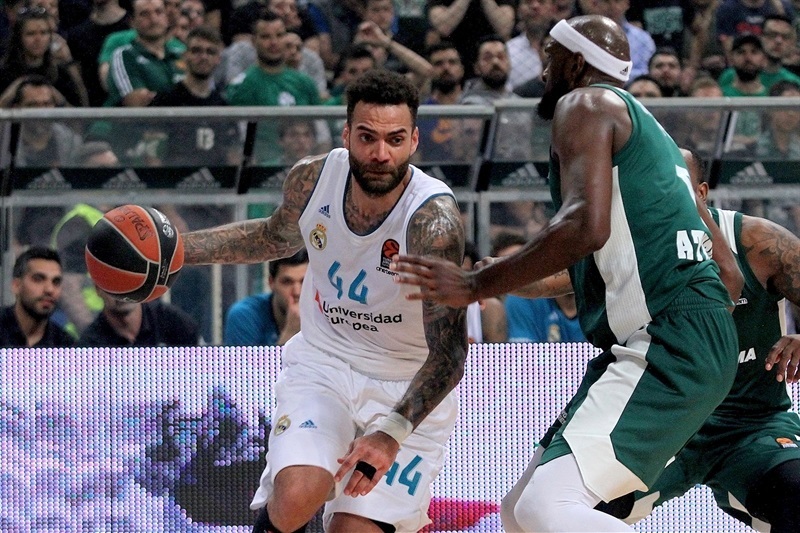 However, Thompkins sank a three-pointer, James buried a jumper and a free throw by Ayon gave Madrid an 80-84 lead with 1:17 left. Free throws by Doncic allowed Madrid to return home with a good-as-gold road win. 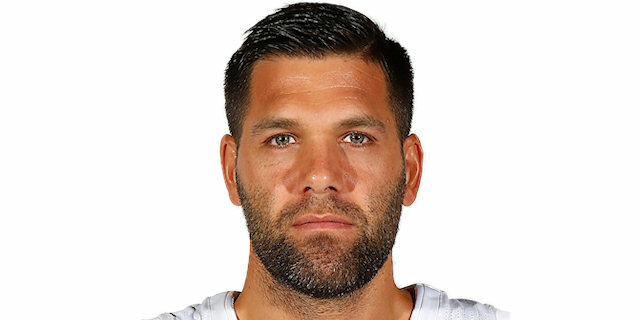 "I think that today was a typical playoff game. It was a point-by-point game and Madrid probably won because they have more experienced players than us. This is why today we couldn't play good defense in the second half; they scored 53 points. We couldn't control the defensive rebounds and because of this, we lost the rhythm of the game. I think that it was very clear that today Madrid had the rhythm of the game in the second half. They controlled the rebounds and punished all of our mistakes on defense with open shots. We missed a lot of open shots on offense because we felt the pressure of playing at home. I think it was very clear. The series is only 1-1, tied, even though we have the feeling of losing an opportunity with this home loss. We have to improve in defensive aspects in Madrid, which didn't work well for us today. Everything was perfect in Game 1 and things didn't go that way for us tonight, especially in the second half. We made a lot of tactical mistakes which cannot happen. On the other hand, Madrid made the most of its talent with players with a lot of experience. That made them punish us in a lot of actions. We have to prepare well for Game 3, play with good mentality and be positive, knowing that if we do things right, we will have chances to win." "Sometimes basketball is as easy and as difficult that little things can change a lot in two days. I think that our performance the other day was not good. We had the feeling that we were not ready. There is a Greek guy who has like a little store right next to our hotel who told us. 'You look like chickens. You didn't want to win or what?' It was easy, but it was good. I think that we played with a lot more courage today. We were very aware of every situation during the game. I don't think we played a great game in the first half, but we were able to stay solid and in the second half, we got open jumpers, hit them, and that gave us an advantage and an important victory. For me, like I said the other day, this just has started. We have to keep concentrating on thinking about the next game at home on Wednesday." "I have experienced players, but that experience comes from a lot of previous battles. I also have players in their first EuroLeague season and I think it was very important the whole team knowing how we have to play these games. 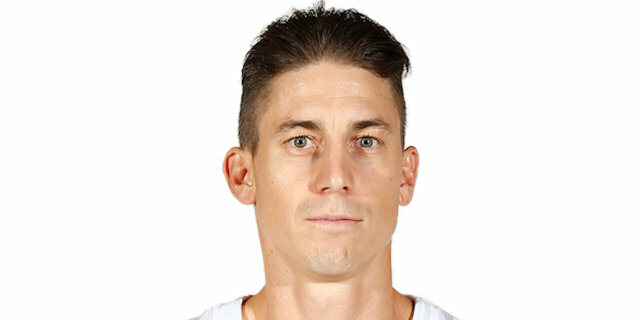 I think Rudy [Fernandez], Jaycee [Carroll] and Felipe [Reyes] played a great game, but it is finished. We have to think that we have to play better if we want to win this series. We have to play better on Wednesday. 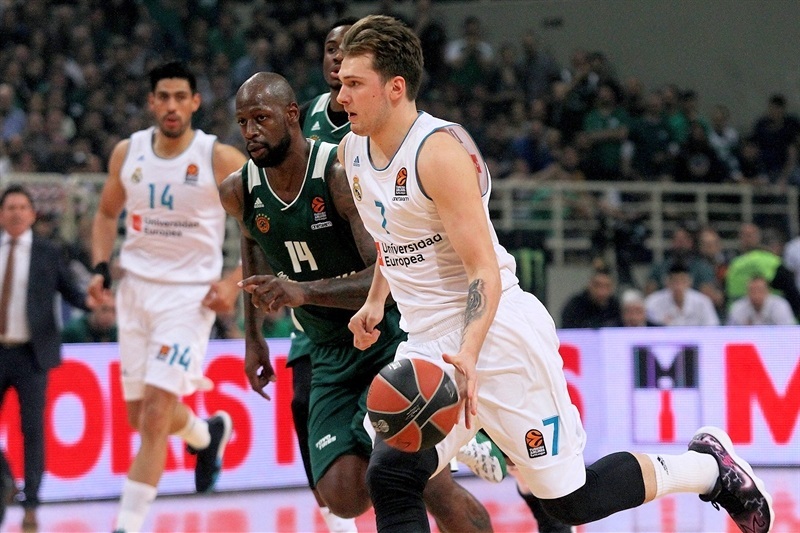 I think Luka [Doncic] and Gustavo [Ayon] played great because both had a lot of control of the game, one outside and the other inside. When you talk about a team thing, nobody will talk about [Chasson] Randle and Randle gave us 13 very important minutes with Luka in foul trouble. 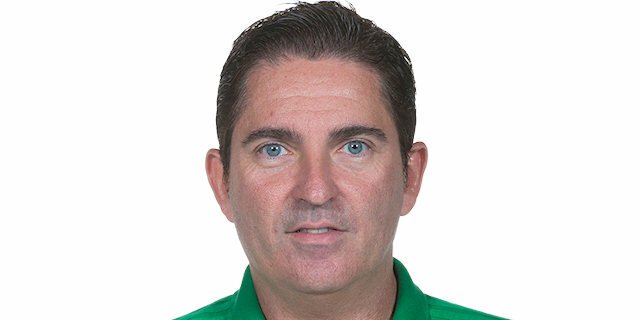 It is easy to talk about players who played good, but for me, like I always say, it is very important that everybody in the team is ready to do positive things for the team." "I think tonight it was obvious on the defensive end that we had too many lapses. No defensive rebounds and no rotations. But you don’t win a series in one game. This isn’t a closeout game. We understand that whether we won or lost tonight, we had to go win a game in Madrid. That's the key. So we want to just try to be ready for Game 3. We will be ready." "We have to win two more games, so we cannot settle for this win. The other day's loss was tough. We were hurt in our pride and knew we couldn't keep going like that. We knew that by doing better, the game would be different for us, and that is what happened. We had a good start, everyone who came off the bench was focused and contributing. This is the way to beat teams like this, with everyone contributing. I am proud of my teammates because we were able to bounce back after a hard loss. We showed we are Real Madrid and this is the way we have to play; what happened in Game 1 was a bad day that everyone can have. We have to keep working in this direction, knowing what happened if we lose our focus. We have to play at least the way we did today, at home, in front of our fans." "We came out and played a lot better game today. 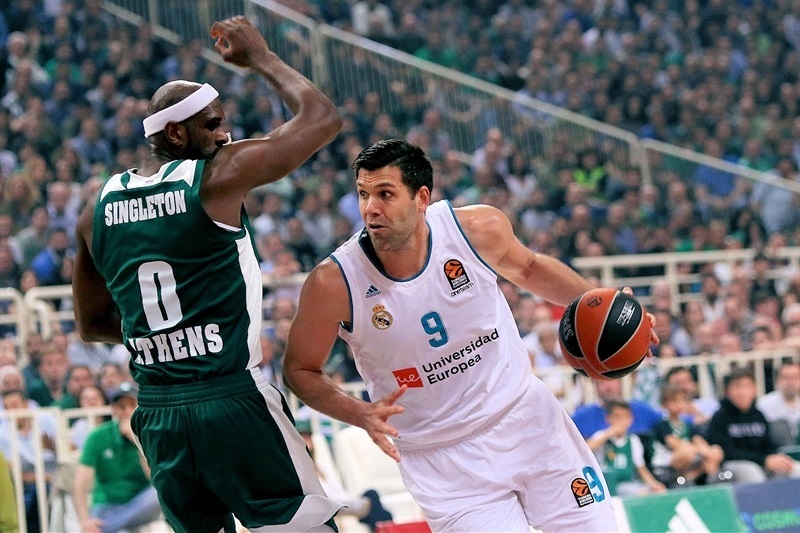 We were ready from the beginning, executed our game plan much better and Felipe Reyes came in and did an amazing job. He has done that for years. I think we have all come to expect that from him. He came in, fought and did the dirty work. It was a good team win today."